On 4 and 5 October 2019 the 2nd Future Congress for Dental Implantology/49th International Annual Congress of DGZI will take place in Munich. The theme of the conference will be „Perio-Implantology: Implants, Bone & Tissue – Where are we and where is the journey heading? Under the motto „Visions in Implantology“, the German Society for Dental Implantology (Deutsche Gesellschaft für Zahnärztliche Implantologie e.V.) 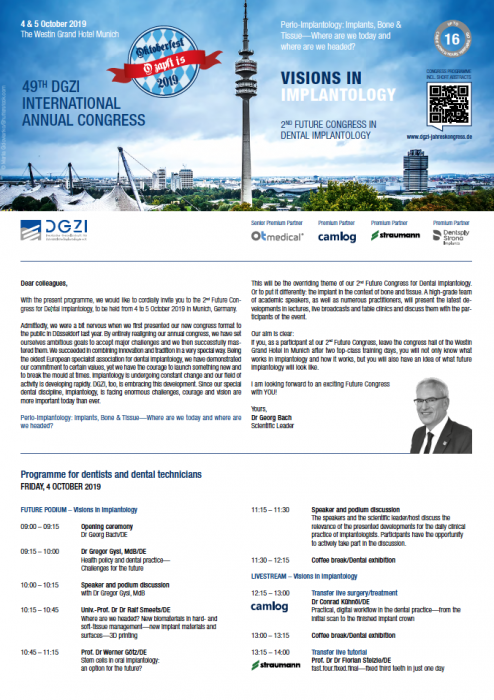 organized the following events (DGZI) held its 48th International Annual Congress in September 2018 in Düsseldorf for the first time with a completely new concept as a future congress for dental implantology. The event was a great success. Click here for the english programm.